Let me describe to you my observation and impression of a typical Pinoy Elite Long Distance Runner. First of all, I would like to define what I mean by a Pinoy Elite Long Distance Runner. He is a locally raised person with a raw talent and skill to be fast and strong in long distance running. He is considered as an Elite Runner if he can finish a 5K race/run (on the road or track) in less than 15 minutes; and he/she has a PR time in 10K run/race (on the road or track) in less than 32 minutes. If a long distance runner could not attain these PR times, then he/she is not considered as an elite runner. A typical elite long distance runner is raised from a poor family, let me say, from a family who is residing in a barangay which is far from the center of population which is the municipality. Most likely, their house is located in a mountainous area where one has to travel by foot to reach the basic services of the municipality. Since the primary education is free in the province and the head of the family has the desire to have his children take advantage of education, the children has to walk from the barangay to the center of the municipality in the early morning and walk again to go back to his house after classes. Those daily hikes up to the time he graduates from elementary would develop his endurance capability—physically and mentally. The hiking will continue once he has the interest to enroll to the secondary school. As he goes up on the ladder of those four years of high school, he will be exposed to Physical Education, popularly known as P.E., one of the required Subjects every year in High School. Whether he is tall or not, he will be exposed to running as one of the “basics” in Physical Education classes. 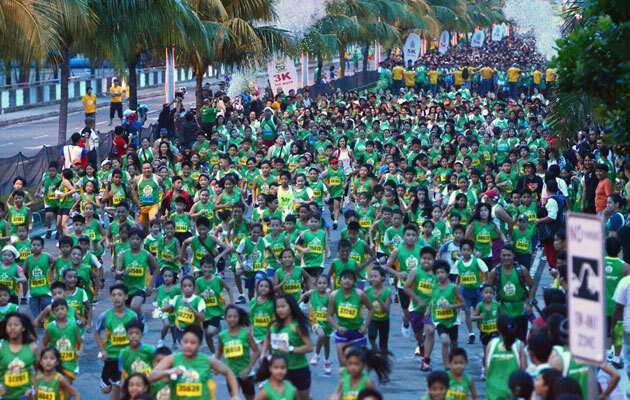 This is where he is discovered by the PE teacher that the “boy” from the far-flung barangay has the speed and endurance to finish a race, whether it is a 400-meter run or longer distance events. Initially, he will be “coached” by the PE Teacher in the school and he will be given an instruction to do some training in preparation for the local running meet among the schools in the province. To make the story short, this “boy” will be a consistent winner in those annual/periodic meets or races among the schools in the province. Ultimately, he will be a part of a Team Delegation from their province for a much bigger Regional Athletic Meet. This is where he will be discovered by Coaches from the different Colleges and Universities located in Metro Manila. Once this “boy” graduates from High School, he is already ready for recruitment for a College/University Education Scholarship offer. As a result, he will be a member of the College or Varsity Team and will be able to contribute points in the annual competition among Colleges and Universities. Due to strict and more disciplined way of coaching in College/University, the “boy” will become stronger and faster, gathering more skills and techniques, and most of all, will be exposed to other fast athletes coming from the other Colleges/Universities. Demanding Coaches will try to find the physical limits of these endurance athletes and at the same time making sure that their academic standings are also satisfactory. However, in my observation, most of these athletes recruited from the provinces have lower I.Q.s and most of them could hardly pass their academic requirements. If one is an “asset” or “top athlete” and has the potential to be included in the National Pool of Athletes, most likely his grades would be “manipulated” by his Coach or the Academic Staff. He finishes as an ordinary College Graduate but in reality, he has only acquired the skills and training to be a fast and strong long distance runner. It is very doubtful if he ever learned from the other Subjects offered as required in his curriculum while he was in College. For those who are not fortunate enough to be discovered by College Coaches from Metro Manila and were not able to earn their way to a College education, their talent/skill in running would be discovered by relatives who are also passionate in long distance running. It could be a friend or a close relative who would influence this “boy” to be exposed to long distance running. From a simple training program copied from the Runner’s World Magazine, the relative/friend would give this training to the “boy” and most likely, it would result positively to his training. The “boy” would personally discover on how he would run faster and stronger through experience in his training. If he thinks he is ready for “fun runs” in the locality, he would join and find out if he can win the top prize with some cash to bring home. If he wins, then that is the start of more races for the local “boy”. This “local boy” would try to find out more “fun runs” with cash prize/s and dream to be living in a bigger city or Metro Manila for him to find a job and at the same time join weekly races. Now, you have two distinct types of elite runners; a College-Graduate and a “Barangay” Runner. Most likely, the College Graduate runner will only run shorter distances like 3K and/or 5K and they do their training on the oval track. The “Barangay” Runner would be running the 10K and longer distance races and most of them are training/running on the roads and trails. Sometimes, their ambition in life is very simple. The College-Graduate would like to join the National Pool of Athletes and at the same time employed in an establishment that promotes sports. The “Barangay” Runner would like to be employed also in Service-related jobs but most of them would like to have a chance to be recruited in the Armed Services. I had been exposed to both College Graduate and “Barangay” Runners. However, most of the College Graduate Runners that joined and left my Team started as “Barangay” Runners and transformed to run longer distance up to ultra marathon distances. Most of them now are with the Philippine Army and I am surprised that they don’t like to be included in the National Pool of Athletes. Some of the “Barangay” Runners who left my Team are still joining local races and ultra marathon races where they shine and always land on the podium finishes. In the past, I have exposed some of my runners to International Competitions and most of them did fairly well. There were some problems and challenges that I have to deal with in bringing these athletes to international competition. But with the able support of some friends from abroad and in the country and proceeds from ultra races that I have organized and directed, I was able to prove that these elite long distance runners can compete among the top ultra runners in Southeast Asia/Asia without any corporate brand as the Main Sponsor. What made me to stop with this personal quest to bring our ultra runners to international competitions? The following reasons are very personal and I really don’t know what is the “other side of the coin” from the athletes’ point of view. 2. The “Master” Knows Best—The master knows what is best for the runner, period! A master should be a passionate long distance runner, too! Obviously, he would be able to understand the mind and actions of his elite runner. The body language of an elite runner shows whatever message that a master would like to know from him. Such body language could be seen from a constant communication between the master and the elite athlete. Above all, communication is the best tool and means to determine the overall attitude of his athlete. 3. Collaterals Are Not Included—I can support the training and other miscellaneous training expenses for an elite runner but I could not afford to extend the support to his family (either to his wife and children or relatives). An elite runner should be able to detach himself from his family during the peak of his training and he should be focused to excel on the event that he is preparing for. An elite runner could not maximize his training if his wife and family are with him always. 4. Think and Dream “BIG”—It is always the right formula for success and for media to get one’s attention when an athlete would first Win “BIG” (podium finisher or overall top ten) in a prestigious international ultra running event. In this age of social media through Facebook, Twitter, You Tube and blogs, a good performance of an athlete could be easily known on a “real-time” situation or immediately after an event. With the number of runners and ultra runners who have Social Media accounts, such exemplar deed could be viral and easily picked up by the media. And once the traditional media (TV, Radio and Newspapers) picks up ones outstanding deed, everything will follow. Who knows this will be the time that corporate brands will start supporting such elite athlete and not those local average ones who have yet to taste of landing on the podium finish or top ten overall award in international running events. 5. It’s All About Character and Reputation—Trust and Confidence between the Manager and the Elite Athlete is a must. These values are non-negotiable. The Manager is just a tool or a bridge for the elite runner to be exposed in international running events and the honor/prestige goes to the athlete himself and for the country as a whole. The athlete must be able to trust his Manager as the Manager would “move heaven and earth” to explore and use all the possible means to support the elite runner. In return, Honesty, Respect and Courtesy are the only things that matter for a Manager to receive from his elite runner. In conclusion, no matter what you have done to expose our elite runners to international competitions, the cycle continues. People change. Loyalty changes from one person to another or from one institution to another. We look for shortcuts and easy ways to attain our goals and objectives. We don’t trust those “hands that feed us” and simply ignore them, and worse, try to bite them! But worst of all, we try to make a living out of being an elite runner and by all means, be a coach and later as a Race Organizer and Director of a Running Event. I might have stopped “looking and eyeing” for an elite long distance runner for ultra marathon races abroad but I am thinking positively that one or two of the corporate brands in the country will have the initiative to train, support, and finance a “loyal, intelligent and passionate” elite ultra runner to represent our country to the most prestigious ultra races in the world.